Livestock producers in the Northeast tend to have very few legumes in their hay fields, and often fewer than they would like in their pastures. Universities and popular press have extensively promoted alfalfa to dairy farmers over the last several generations, and companies have heavily invested in developing new varieties. Under the best of conditions, alfalfa plants typically do not live more than 6 or 7 years; in situations where drainage is poor and/or pH is low, the plants will not yield well and most will disappear in less than four years. The result of this has been that many farmers in the Northeast do not like alfalfa and many have ceased to be concerned about whether they have any legumes whatsoever. When discussing the merits and demerits of different pasture grass and legume species, New England dairy farmers are quick to point out that the feed quality of alfalfa is often over-stated (given lower NDF digestibility) and that grass haylage can offer tremendous quality. 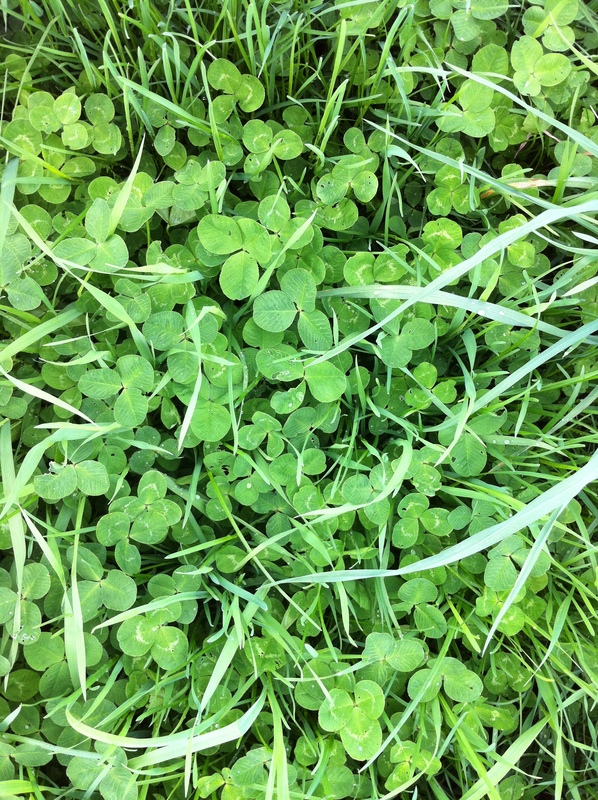 If you have great grass on your farm, why consider clover at all? Compared to N-fertilized grass alone, red clover grown in combination with grass can increase annual forage dry matter yields by 30% in addition to boosting overall protein of the sward by 3-5% (or more), depending on the proportion of red clover and the cutting. Further, because of a compound (polyphenol oxidase) found in red clover, red clover haylage has 40% less non protein nitrogen (NPN) than alfalfa haylage. A USDA-ARS study found that cows fed a ration that included red clover haylage produced 69 pounds of milk on 49 pounds of feed, while a ration that replaced the red clover haylage with alfalfa haylage yielded 68 pounds of milk on 54 pounds of feed. Nitrogen efficiency in the cow was also found to be higher, which has several benefits not the least of which is lower metabolic costs associated with excreting nitrogen. While nutritionists and dairy farmers could argue whether alfalfa or red clover haylage is superior (more profitable) for inclusion in a dairy ration, for those who cannot grow alfalfa, red clover is an excellent option that can nicely complement the grasses already in the field. Note: while it is possible to make dry hay from red clover, it is often challenging. This discussion is oriented toward haylage and pasture systems. Unlike most other legumes (especially alfalfa), red clover is quite shade tolerant, which is why it is a favorite for frost seeding into existing perennial pastures and even winter wheat. 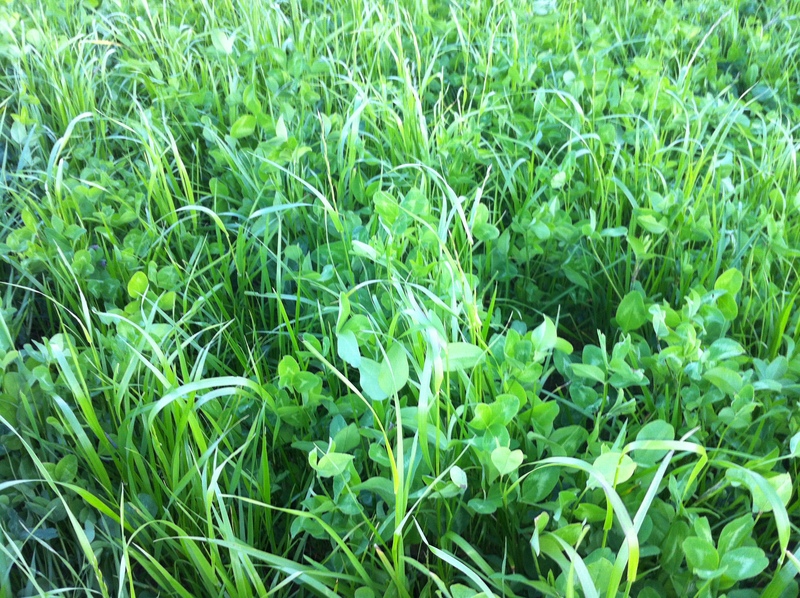 It is not uncommon to formulate frost-seeding mixtures for pastures to include 2 lb/ac of ladino white clover. In haylage-only systems (i.e., the field never gets pastured), however, including white clover in the frost-seeding mixture is not advisable because red clover offers so much more yield potential. Further, it is likely that white clover would provide significant light competition for the red clover during the early stages of growth between cuttings, although there has been little or no research done on the subject. 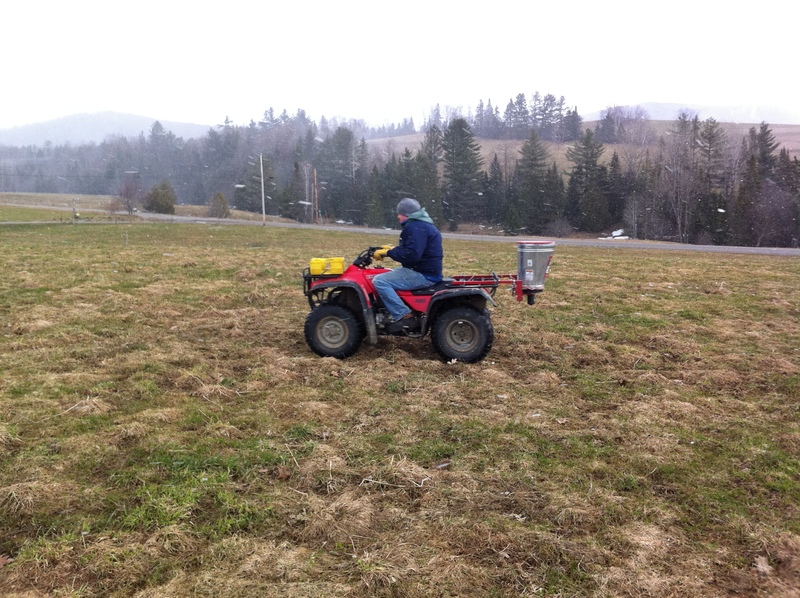 Frost seeding in Vermont. If you click on the picture you can actually see some flakes flying. 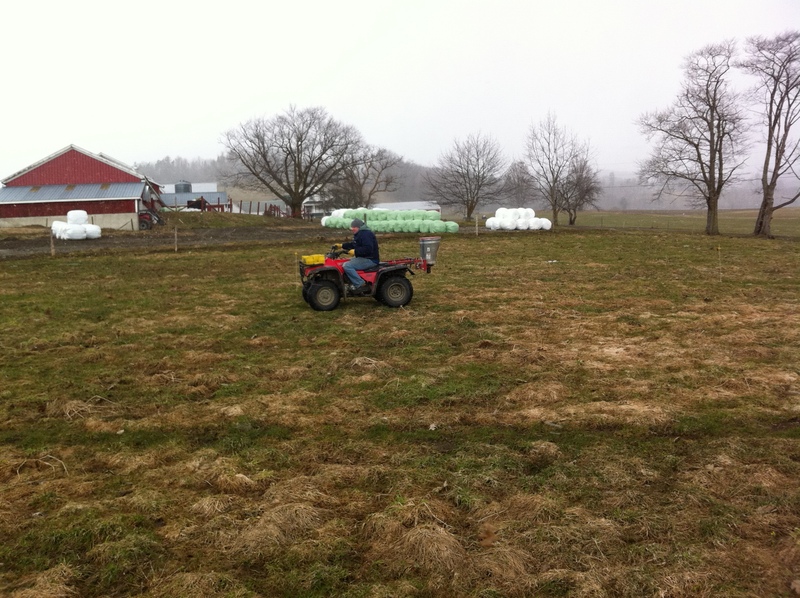 The first goal of frost seeding is to uniformly distribute 6-12 lb/ac of red clover seed on the fields in question. While there are various ways to accomplish this, the simplest is an ATV-mounted spinner spreader such as the Herd seeder sold by Kaso Manufacturing Company. If you use this type of spreader, be sure to check your broadcast pattern and calibrate so that you don’t run out of seed prematurely. If you blend red clover seed with fertilizer or other types of seed, keep in mind that each component will have a different broadcast width. Farmers have also successfully increased legume content in established hay fields using conventional and no-till grain drills, but the conditions need to be right. Using a drill will probably work better than broadcasting if the freeze-thaw cycle is all or mostly over (but the grass has not started growing) or if the soils have low clay content. Regardless of the equipment you use, the main objective is to give the seeds some seed-soil contact – you are not trying to put the seed 1/2” below the soil surface. If you only have access to a conventional grain drill, the seeding is best done during the warmer part of the day when the surface of the soil has thawed somewhat (with plenty of frost below to prevent rutting). The openers will probably only scratch the surface, and the press-wheels will help improve seed contact with the soil. Keep in mind that this is often harder on the grain drill than pulling it through a prepared seedbed in April; going slower will help minimize damage. There are other inventive methods farmers can use to get the job done. If you have another approach in mind, be sure to verify that the seed is being applied uniformly and that most of the seeds are getting in contact with the soil. Named varieties are ‘safer’ because you know what you are going to get, but they are also more expensive (sometimes a bit over $3/lb). That said, I have had good success with variety not stated (VNS) red clover seed (usually closer to $2/lb), but there was one occasion where the VNS red clover turned out to be a ‘mammoth’ type of red clover. While it has its place in northern cropping systems, mammoth clover is not usually desirable in a perennial pasture or hay field because it does not yield much in the first year and gives one massive cutting in the second year. While this picture was taken a year after seeding, this is pretty much what Mammoth Red clover looks like in August after seeding. Attempts at frost seeding can be very successful or complete failures. What makes the difference? 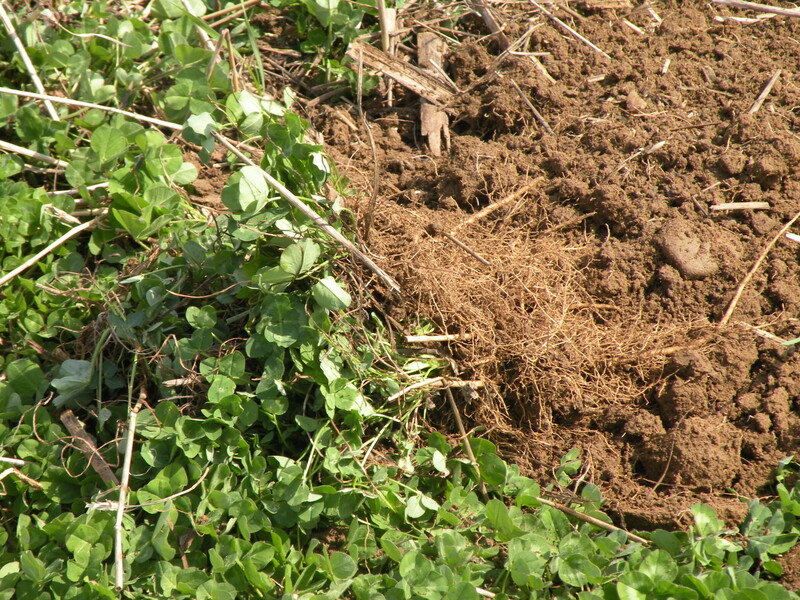 Seed-soil contact: the shrinking/swelling soil as it freezes and thaws should improve the contact of the clover seed with the soil. Soils with a lot of clay tend to shrink/swell a lot, while sandy soils do not. Keep in mind that the presence of excessive thatch can keep much of the seed from reaching the ground at all. Soil conditions Droughty, very poorly drained, acidic, and nutrient poor soil conditions can all contribute to the failure of any type of new seeding including frost-seeded red clover. Frost seeding often does not work well in fields of well-nourished Kentucky bluegrass. Note also the amount of thatch that will reduce soil-seed contact. Competition for nutrients, light, and moisture can all lead to frost-seeding failure. The Kentucky bluegrass field next to the barn generally will not respond well to frost-seeding. The abundant N present from past manure applications together with the sod-forming nature of Kentucky bluegrass make it difficult for clover seedlings to get a start. Kentucky bluegrass also has a shallow root system and that can quickly exhaust the moisture in the top two inches of soil, increasing stress on the seedling. Red clover can take quite a lot of shade for a little while, but there are limits. This is another reason to be timely with harvesting your first cutting – to open up the canopy to give the clover more light. 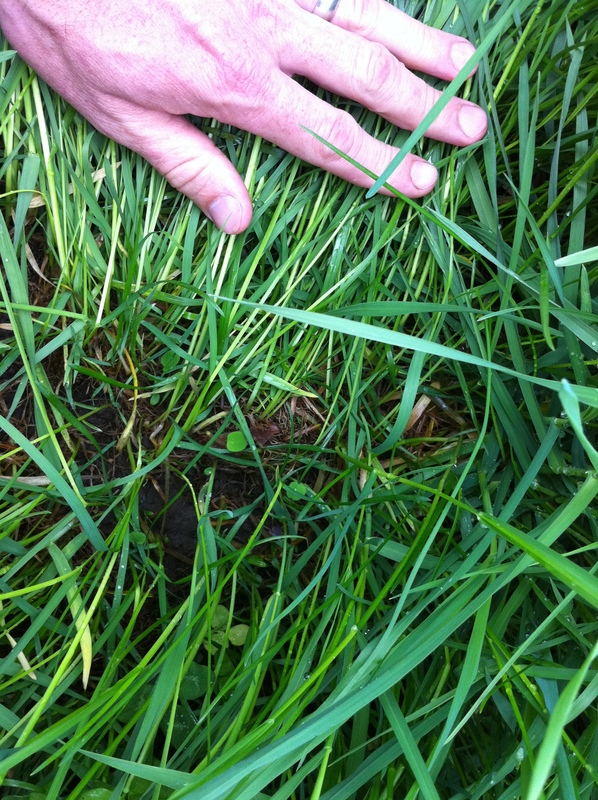 Keep in mind that in the year you frost-seed, you probably will not see significant clover present until July. These small unifoliate-stage red clover seedlings need to get more light soon. Timely first-cut harvest is essential to frost-seeding success. Abuse. There are many ways to kill a plant. One very good way to kill (or severely handicap) a clover seedling is to cut your hay at 2” when the clover seedlings are only 3” tall. Many farmers routinely cut their forages too low, which reduces the annual yield, reduces quality, weakens plants, and introduces more soil (which shows up as percent ash in your forage analysis) into the harvested product. Keeping your harvest height over three inches offers many benefits including enhanced establishment of the red clover seedlings. Red clover that is well established in the first year generally will expire by the end of the third year. The cost of the seed compared to the value of the improved yield and quality of the haylage is the main argument for frost-seeding every year. 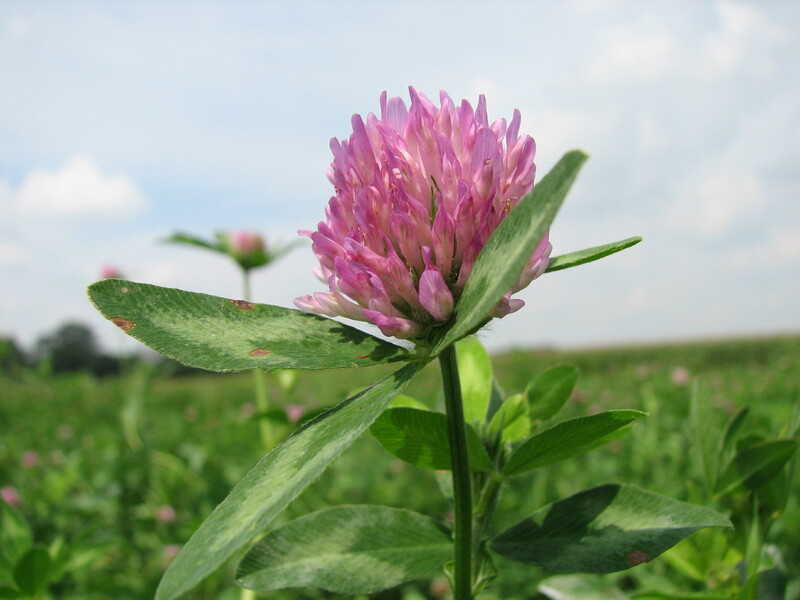 If you have conditions that are good for frost seeding and choose to frost-seed every year, the lower rates (5 – 7 lb/ac) are probably sufficient to maintain an abundant population of red clover plants in the stand. If you are frost-seeding for the first time, a higher rate (8 – 12 lb/ac) are advisable. Addressing soil fertility problems, especially low potassium and low-pH, will improve the establishment, vigor, and longevity of clover plants. Reference in this article to the Herd Seeder is not an endorsement by UVM of the product or company or a claim that it is superior in quality, functionality or value to other products that are on the market.